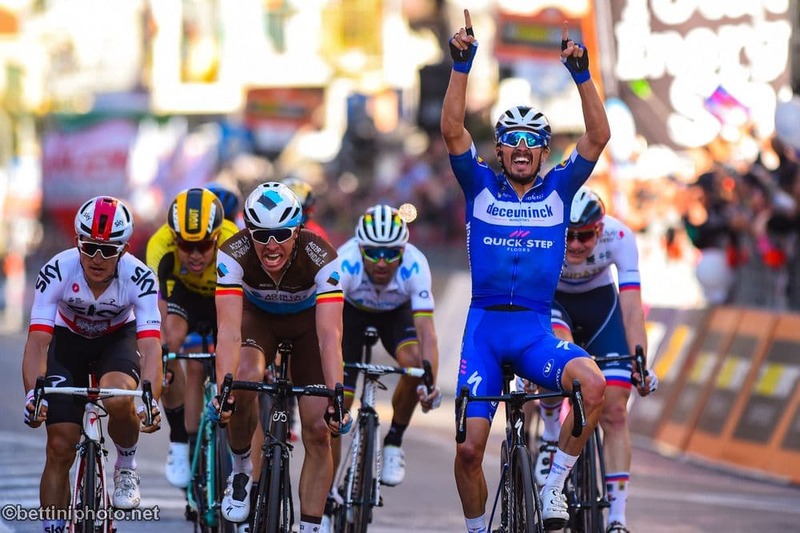 Alaphilippe has been on winning form this season, winning the Strade Bianche in Tuscany, and two stages of the Tirreno-Adriatico in recent weeks.The rider from the mountainous Auvergne region in central France had missed out in the 2017 race in San Remo behind Kwiatkowski and Sagan. But since then he has powered to two stage wins in last year’s Tour de France, where he claimed the top climber’s jersey, and won the Fleche Wallonne and Clasica San Sebastian. All that was missing was one of cycling’s five ‘Monument’ one-day classics, and he lived up to his status as pre-race favorite in a race which his Deceuninck team perfectly controlled. In the sprint, Alaphilippe emerged from behind Slovenian Matej Mohoric, before the last 200 meters. “We made the race hard and I stayed focused. I followed Mohoric at 600 meters. I made no mistake. It’s unbelievable,” continued Alaphilippe. A breakaway group of ten riders, representing second-division teams invited by the organizers, had opened the road right out of Milan. But no one could break out alone on the streets of San Remo, despite an attempt by the Italian Trentin neutralized by Belgian Van Aert. “Alaphilippe was untouchable today. He was the strongest on the Poggio,” said Naesen. “He launched the sprint from very far away with a headwind against very fast riders like Kwiatkowski, Sagan and Trentin. “I recovered in the downhill after I sped up on the Poggio but I still thought it would be complicated to win considering the quality of the riders I was away with,” said Alaphilippe. “Then I stayed calm and remained next to Peter Sagan. When Matej Mohoric launched the sprint, I knew I had to take his wheel straight away. “Had he taken 20 meters, it would have been game over. I capped it off the nicest way I could. It’s pure joy,” said Alaphilippe, after his 25th victory, and the most important of his career. He becomes the 14th French winner of the race since the inaugural edition was won by compatriot Lucien Petit-Breton in 1907. 10. Matteo Trentin (ITA/MIT) s.t.